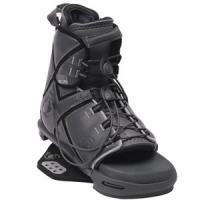 I would like to replace the Spin boots on my HL Motive wakeboard. This is something I'll be asking my wife/kids to get me for Christmas. I doubt that I'll be able to test fit any (not that fitting in a store really tells me much). I'm not sure what else to tell you other than I wear a 10.5 shoe and I would probably prefer the value of an '05 model to an '06. Would I want to stick with HL boots? I've had the Byerly recommended to me by a green-haired boarder, but it looks like it might be tough to get on and off. The Murray looks right up my alley, but I don't know anything about it, other than what it looks like. Any thoughts, suggestions will be much appreciated. The Murray & Parks are typically said to be very comfortable. Another one to consider would be some standard sized Splits unless this board is used exclusively by you. That would give you better versatility for others using that board (like I said, this may or may not be what you're looking for). You really need to go try a few different ones on to decide what you like best - some have front lace ups, some have rear, & they all have different ways/systems of cinching them down over that. People tend to be really polarized on which is better, & the you're the only one that will know which you like best. I have the 04 Byerly's, they work great. I also have the 04 HL Higbacks, I like those alot. Hyperlitenerd had his LF board and LF Transit bindings at the lake a couple of weekends ago. I got to try them and they were SWEET! Check Ebay, lots of bargains right now. I personally recommend the 05 LF transits in a Large. They provide a lot of support and the foot bed is super soft. If you have knees like mine you will appreciate the soft footbed. Make sure you check out the Transits on your foot as they tend to run narrow. They are a very nice binding and they are what my son, daughter and wife all have. They love them and they are what I thought I would get, but they hurt my feet. I got the LF Team instead and they are great. Very comfortable and lots of support. We have three sets of Byerlys - they seem to be a favorite. HL Splits on the boat board. I'm gonna jump in on this discussion. I only board a few times a year, and my biggest problem with boots are when I land, my feet slide forward a couple inches. They seem super tight and even difficult to get on, but my foot still slides. It puts me off balance, moreso than normal. My foot is not too wide or too narrow, but I have a high arch. I dont need fancy boots, just some that hold my foot where it belongs. I've got a pair of LG 05 Transit and Team bindings left. If interested let me know. I have found the LF Team to be both very comfortable and very supportive. My foot doesn't move a bit. I know that the others feel the same way about their Transits. I demoed some HL Murrays and did not like them. My feet were hurting afterwards. I know that others have liked them, but they just didn't work for me. This all underscores the need to try them on at least, or even better to demo them. Some of the new offerings from CWB also seem nice. My son tried them out and liked them before settling on the Transits. Not just try them on, leave them on your feet for 10-20 minutes in the shop. People used to rave about the HL 30/60s & those were like the iron maiden (not the group) for my feet. Hey, I had some old HL 30/60's which I liked a lot, but my wife said the graphics on them were embarassingly outdated, thus the new LF Teams. They were easy to get on and off for me, but not as much support or comfort. Exactly why people need to go try them on & leave them on in the shop for a bit. Everyone's foot is different. i'd pay the exrta dollar and get the new watsons or shane boots. the new liners are awesome, you don't even need to use your hands to get your foot in the boot. I LOVE my byerly's... I've had the same pair for about 3 years and absolutely love them and HIGHLY recommend them. Surely, someone on this site has feet similar to mine. Now, if I could just figure out who that may be, I could get some real good advice. For starters, I have normal feet, no funky toes, size 10.5. If you all wouldn't mind posting pictures of your feet, or at least give a good description when you make a recommendation, that would be very helpful. If you could wait I would tell ya to check the new CONCRETE "Futures" but thats only cause I rep em. In my opinion the LF boots are top notch they are doing things both in design and support that we at Concrete used to lead the industry in. I know you said you would like to stick with Hype but please atleast check out the 05/06 teams and the 06 watsons are insane. Now that's as honest as you will ever hear one rep say. I will say that I moved to Liquid Force last year & haven't looked back, but I have a girl's foot & wear a girl's boot so I don't know how much help that really is. With a size 10.5 foot the large transits will be perfect. Do not get the large narrows. Looks like Strees_Relief has a pair with your name on them. If I were in the market, I'd have to look at the LF boots for comfort alone. (Given my knee issues, maybe I should be looking come spring.) OBTW, I'm a 9.5 to 10 shoe size depending on the brand with a slightly wide foot (E) and a high arch. One more thing, I spent a good portion of my first season wakeboarding with a serious ankle injury because my store fit put me in Belmont XL's. I ended up two sizes smaller. If you're going to do a store fit - take some lube along and get them a bit on the snug side. OT: Lou, since Shapiro is no longer with O'brien, what LF board was he using? does have his own LF board coming out? i have the 04 transits.....most comfortable binding i've ever used. He had every LF boot and board available, but I didn't try any until the last day as I didn't want to spend my limited time adjusting to the feel of new gear.